Anything Goes! : Extra, Extra, Read All About It! I came home this evening and wifey had some exciting news for me. No, no, we're not having another baby and neither did we win a million bucks, although I wish we did. This news was much less dramatic but exciting all the same. 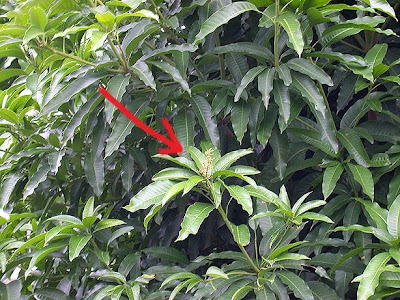 Remember my mango tree? The one I posted about on two occasions? Yes, the very same one that my neanderthal neighbour was giving me hell about and was forever complaining that the leaves were being blown into his compound (like as if I was some kind of weather God and could control the direction of the wind) and that the tree might topple into his precious little house. This time, both wifey and me decided to not entertain anymore of his rantings and we're going to keep the tree as shady as it's meant to be. To hell with leaves being blown into his yard. He can take it up with the wind God if he has any issues with that. Ok, now back to the main reason for this post. That mango tree has only produce fruits once in its entire existence and that was the first time we cut the tree. It was like revenge of the mango tree. It produced so many fruits that I started giving them away to anyone who wanted it, the grass cutters, the post man, the municipal people who passed by, anyone. But that was it. After that period of about a few months, the tree stop producing fruits and has been like that for years. And I started missing having mangoes to eat. I love mangoes, especially the green ones that are not fully ripened yet. I would pluck them off the tree while they're still young, cut them and eat them with salt. Heavenly ... darn, I can feel my mouth salivating already! That was when I wished the tree would bear fruits again. No amount of pleading, cursing or molly coddling make that tree produced even one single fruit. I had to resort to buying unripened mangoes to get my mango fix ... LOL! But then today, I came home and wifey excitedly grabbed me and pointed to the tree. 'look, what do you see?' she said. I looked at where she was pointing but for the life of me couldn't see anything at all. 'What am am I looking for?' I asked her. 'There, over there, do you see that mango fruit?' She said. 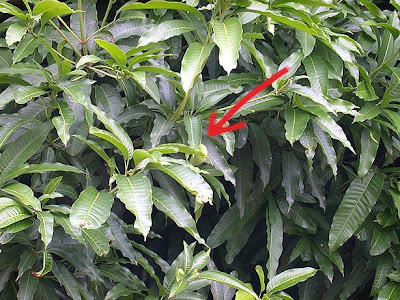 Even then, I still couldn't see it but after squinting and looking at the tree from all kinds of weird angles, I spotted a tiny little mango fruit hiding between the leaves. Heavens be praised! The tree is fruiting again. I was ecstatic! I was jumping up and down like a little boy. You can see how tiny the fruit is in the picture below. Oh god, I can't wait for it to sprout more fruits. I hope they don't keep me waiting too long. I don't think I'm going to need any Outer Banks vacation cos I'm going be sitting under my mango tree patiently waiting for it to bear some fruits. This time I'm not going to share or give my mangoes with anyone. Well, maybe I'll save some for you LP, just get that husband of yours to drive you to my house to pick them up before I swallow every single one of them ... LOL! What did you feed your mango tree? From bare branches to a huge shady fella? Btw, pruning is good. Perhaps that spurred its growth...and it's bearing fruit. Soulie - LOL! I hope not. I'd be one very disappointed man if that happened! Mei Teng - LOL! The millionaire bit la. The Real Mother Hen - LOL! Where got space la? Look at my front yard, I'd be lucky to put a pot of flowers there let alone all those trees you mentioned! Terra Shield - At the moment the fruit is so small, I don't dare touch it la ... hehehe ... Actually why do they wrap up those fruits ah? Samantha - Urrmmm, what's Kei Tak Sek ah? My Chinese not very good la, in fact it's non existent ... LOL! And I haven't been to SS2 in years! 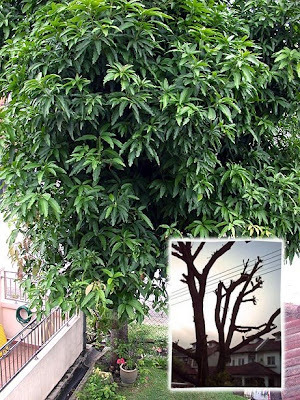 its a really great blog about mangoes trees and mangoes, i have 2 trees of mangoes in back side of my house, they give delicious mangoes every year, now the season of mangoes going to start here in pk. i think this year mango tree will give us more mangoes, i like mangoes very much, mangoes with cream with yogurt and mangoes shakes i like very much. oh the mango season is here again!! I do remember when you cut the branch of the tree and of course your crazy neighbor. And how dare you show that little mango, now I can feel something sour in my throat already, lol! But it won't be long, soon I'll get my share, hahaa! And your neighbour must be dying of envy anytime so you better watch out. Maslight - LOL! No need la, if you're my neighbour I'll just let climb the tree and take the fruits la. It's only my neanderthal neighbour that I have issues with. Ohhh yes, jeruk mangga ... my mouth salivating just thinking about it ... LOL! Terra Shield - That's the same story I heard too but I think maybe it's to keep birds from destroying the fruits. Mama Mia - I wonder if I wished for a million bucks it would grant my wish too or not. LOL! Anny - LOL! Yeah, the leaves do the same thing here but somehow by some miracle I never have to sweep them cos they all magically get blown away somewhere ... hahaha! Anny - Yeah, when it fruits, it just won't stop and then when it stops, it'll be easier to get water from stone than to expect it to fruit! nick.. just to remind you.. you still have to observe the leaves if they go to your neighbor's compound, I just afraid if you neighbor take a suit against you for trespass.. I love mangoes - one of my favourite fruits! And I like it sweet and sour, not just sweet. Your poor neighbour always have to sweep his house compound to get rid of those mango tree leaves! You should give him some mangoes for giving him all the trouble! haha! Foong - The leaves don't really fall into his compound la, he's just an idiot! LOL! Nevermind, one is better than none. It's a good start!